Aside from being nose-deep into the thought-provoking memoir (yeah right), The Andy Cohen Diaries, the deeply disturbing Sharp Objects and the food-filled novel, Off the Menu, my mind has had eight consecutive days of brain-less activities. I’m now convinced I’ve actually lost a few brain cells because of it, although it’s most likely a combination of the mindlessness and the daily tequila consumption. Side note, the tequila in Mexico is NOT the same as the tequila in the states, as I’m pretty confident they infuse some sort of hallucinogen or anesthesia into theirs that’s illegal here. Just saying. Anyways, as you can imagine it’s been rather difficult to ease back into the realities of day-to-day life. I’m no longer served a breakfast of Mexican chilaquiles and lattes. Nor do I wake up to the sight of the ocean and a clear blue sky. And my favorite beach waiter is definitely not handing me my go-to hibiscus margarita at 2pm. Sigh. I can’t complain though, I got to come home to a sweet puppy that loves me unconditionally and missed me terribly. I get to wake up in my own comfy bed, without an aching back. And I get to do what I love most – cook to my little heart’s content. I have a whole arsenal of recipe ideas from my trip that I’ll be sharing later on, but being out of the country and subsisting on guacamole, chips and tacos for a whole week made me crave some of my favorites from back home. Biscuits and gravy was my first craving that I tackled, followed by a crazy delicious and comforting pasta (coming later!) 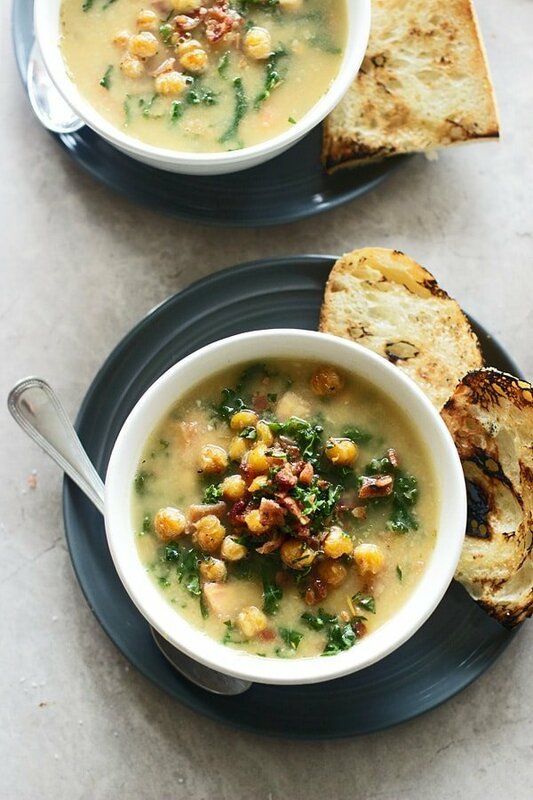 and now, this Chickpea Soup with Kale and BACON. Kale because it’s healthy, and bacon because, well, it makes a soup made out of chickpeas and kale a little more appealing to my where’s-the-meat husband. I went back and forth on creating a Tuscan-inspired chickpea soup (with bacon) and an Asian curry-inspired variation, but if there’s one thing I missed most in Mexico, it was bacon, and as previously mentioned, Kevin does not respond particularly well to a vegetarian meal. 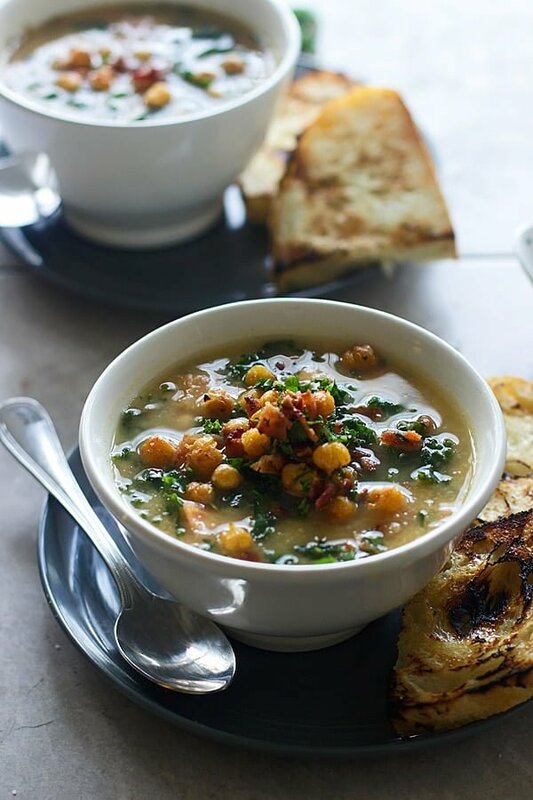 As easy as chicken noodle soup, but with the depth of flavor of a slowly simmered stew, this hearty mostly-veggie dish comes together quickly with canned chickpeas and boxed chicken broth. I thought (briefly) about using, dried chickpeas, but decided against it because, well, to put it bluntly, I was lazy and impatient – the deciding factor in many of my decisions. The base begins with a few slices of bacon (any kind will do), and the fat that’s rendered out is then used to cook the onions and garlic until they’re soft and fragrant. About half of the chickpeas are dumped in, sautéed for a bit and then transferred to the blender along with a little bit of chicken stock to create a thicker, slightly smooth texture. The pureed mixture gets transferred back to the pan, and is covered in chicken stock, the remaining chickpeas, bacon, a little bit of dried rosemary, salt and the ingredient responsible for creating that hearty, depth of flavor – a parmesan cheese rind. At the last minute a copious amount of kale is stirred in, and it’s ready to be served. I garnish with some crispy chickpeas fried in a little bit of olive, a little bit more bacon and some chopped kale. Hearty. Healthy. Delicious. Craving satisfied. Using a paring knife, cut an X into the top of each roma tomato. In a medium pot, render fat out of bacon over a medium heat. Once bacon is crisp, remove. Chop and set aside. Add onion and garlic. Sweat until soft. Add all about ½ cup of chickpeas. Cook another two minutes. Season with salt and pepper. Transfer to blender or food processor, cover with 1 cup of chicken stock. Pulse until mostly pureed; make sure it still has a little bit of texture. Transfer back to the pot and add remaining chicken stock, ¼ cup of the remaining chickpeas, ½ of the chopped bacon, rosemary and rind. Bring to a boil and reduce to a simmer. Once the mixture is simmering, add the tomatoes. Let them sit in the hot broth for 1 minute. Remove and peel and de-seed. Cut into a dice and add back into the soup. Simmer the soup for 20-25 or until the rind of the parmesan has almost fully melted. (It won’t melt all the way). At the last minute add the kale. Season with salt and pepper if necessary. 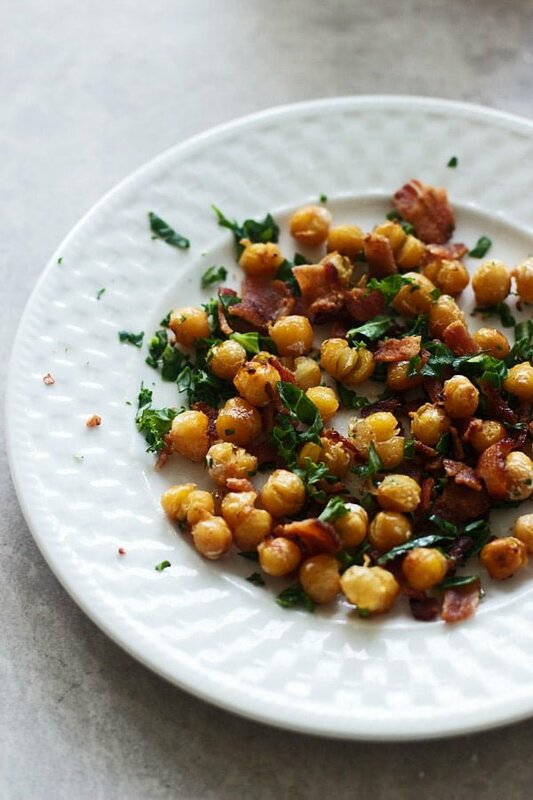 Garnish with chopped bacon and crispy chickpeas. In a small non-stick skillet, heat olive oil to a medium-high heat. Once the oil is hot, add in chickpeas. Fry until crisp. Drain on paper towel and season with salt and pepper. 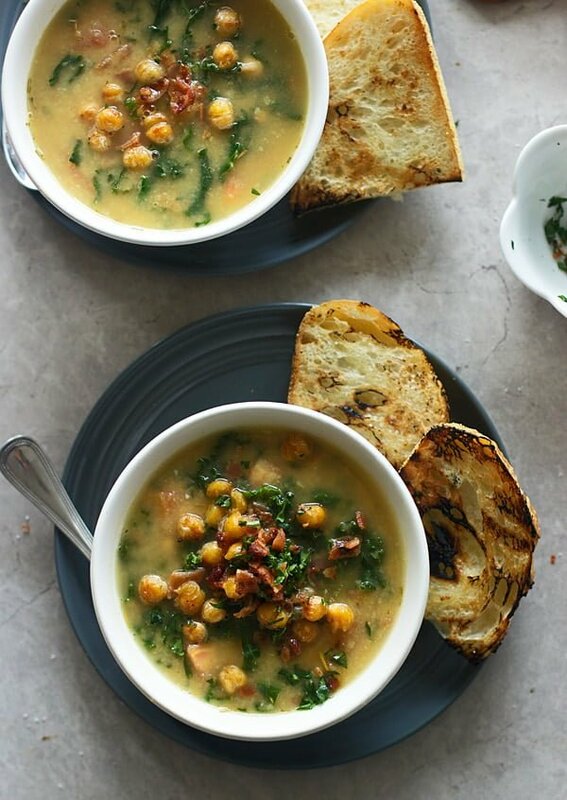 22 Responses to "Chickpea Soup with Kale and Bacon"
Mexico, tequila, and margaritas all sound amazing right now as I watch the snow fall outside. Until then I’ll take a bowl of this delicious soup! That’ll have to do!! I wish we’d get some snow here! It’s been freeeeeezing at times, but no snow! This looks sooooo good! I love the way kale keeps a little bit of a bite when added to soups. And bacon…yum! I love that too Jess!! Thank you! That’s exactly how I felt after returning from Christmas vacation. I couldn’t put a sentence together to save my life. This soup looks absolutely amazing. I’m diggin’ crispy chickpeas right now (just discovered them a week ago, can you believe it). Pinned. Hahaha what is up with that???! I literally sat at my computer screen for like two hours trying to get my post up for tomorrow. Loveee crispy chickpeas! Thanks Jennie! I need to head to Mexico to double check your impression of their tequila. 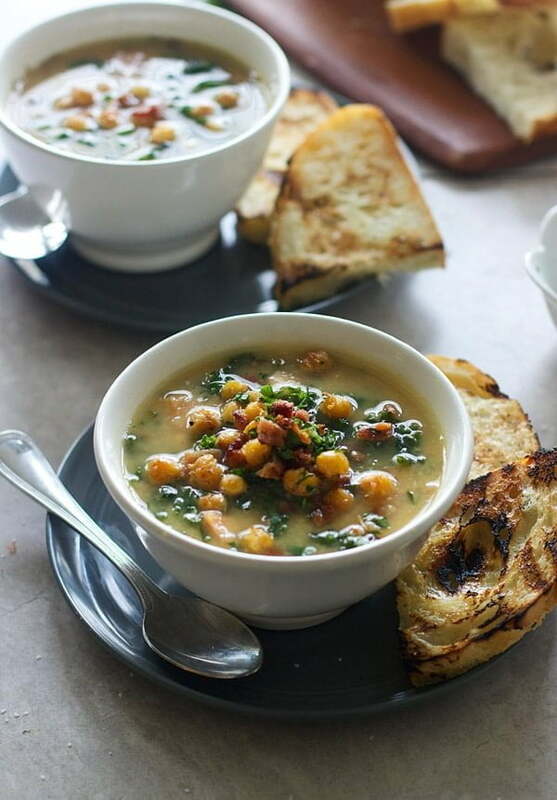 😉 Great combination of flavors in this soup and I love that it’s both simple and easy to make. Yumm!! This soup looks so good!! I just used bacon today and the husband came running into the kitchen because bacon. haha It makes me laugh every time! I lvoe Andy Cohen! And I also want some of that tequila you are drinking 🙂 Unfortunately soup weather seems to have come and gone here 🙁 but this still looks delicious and I think I might have to turn the AC on and enjoy this soup like it is still cold out! What’s kale without bacon? This looks amazing! Sounds like you had an awesome time!!! I love Mexico. Exactly. You get it Karen! We did!! Lovely recipe! Greetings from Sweden! Thank you!!!! Glad to have you!!! This soup looks so goodand tasty! This is delicious and easy. One of my new favorites. For a soup also pretty filling! I have a question thought, do you know the calorie count? Yumo!!! Sounds delish and is just what I’m craving! It’s too delicious for that many people! Your guests will come back after finishing their thimbleful of soup and demand more! I’d recommend serving it to just 3 – 5 people. Haha oops! I will update it! Glad you liked it!